Are you willing to close or completely remove a Gmail account that you own? Yes you may be. There can be many reasons for why you want to delete your Gmail account. The most common reasons are you have multiple Gmail accounts, your are no more interested of it’s user name etc. However whatever your reason or problem is, Google let’s every Gmail users to delete or disable their web mail service from Google account permanently and made this process very simple. What Google is telling about this? 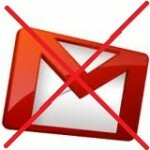 Follow the link below to disable or remove Gmail mail service and username from Google account. https://www.google.com/accounts/DeleteCaribouService – For deleting only Gmail account. https://www.google.com/accounts/DeleteAccount – For deleting any Google product/service associated with your Google account. While deleting Google may ask you reasons for who you are closing this account. Be careful to think again what you are doing before the action.